These easy and delicious miniature meatloaves are a family favorite at the dinner table. Made with a combination of both turkey and beef, they are seasoned with cheese, garlic, Worcestershire sauce, parsley, chili powder, salt and pepper. Each one is topped with additional ketchup for the traditional meatloaf look. 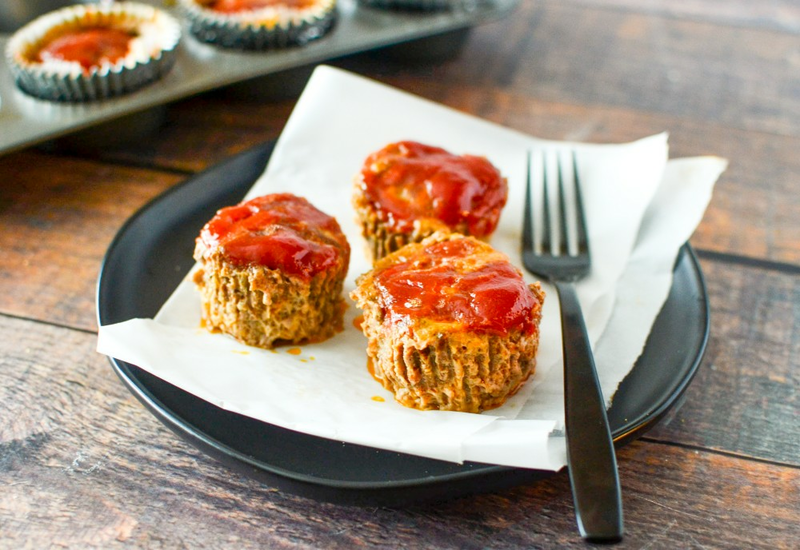 They are baked in a mini muffin pan for bite-sized portions. Anything this cute is always a hit with kids! This can be a fun appetizer or have a few and make it a meal - perfect for busy weeknights! When you are short on time, these mini meatloaves cook in a fraction of the time a typical meatloaf would take in the oven. For bigger appetites, try baking them in a standard size muffin tin! Per Serving: 390 calories; 23g fat; 9.0g carbohydrates; 36g protein; 187mg cholesterol; 843mg sodium. I added breadcrumbs to this when I blended up all my meat. The breadcrumbs helps absorb some of the liquid you normally get at the bottom of your baking pans with meatloaf. I recommend these. These mini meatloaves were so yummy! I loved the beef and turkey combo. These are the perfect size for casual gatherings too. I had some friends over, they brought their kids, and these were the hit of the party. They were also really easy to make, so I will definitely make them again. My kids love these mini meat loaves. Every time my wife or I make them they always ask for seconds. They're also really easy to make, especially on busy weeknights. There were OK. They were super easy but came out pretty bland and all the grease pooled in the muffin liner which was a little gross. Maybe using a super lean beef would help? Mine was 93% lean so not a lot of wiggle room with that. Family also not fans. Kids added a lot of mustard and ketchup before they would eat them and hubby and I added hot sauce. Super sad! I made these for my friends and their kids that came over. Instead of using ground beef, I went with ground turkey only and they came out great. I added garlic powder and onion powder as well. I wish I would have made a double batch, they were gone pretty quickly! The kids alone ate about 3 or 4 per person.